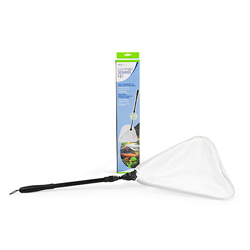 Aquascape Skimmer Net Collapsible White Fine 17.5" The 17" wide fine, tangle free skimmer net catches even the smallest debris, making it ideal for quick and easy removal of leaves and other debris. The quick-latch, telescoping handle extends to 35" and completely folds down for compact storage. Home / Product Types / Nets & Netting / Skimmer Nets / Aquascape Skimmer Net Collapsible White Fine 17.5"